ROSSBURG, OH - September 21, 2018 — On an emotional night at one of the most famous dirt tracks in the world, Brent Marks won a thrilling race, passing fellow Central Pennsylvania Outlaw Logan Schuchart for the lead on Lap 23 and holding off a furious charge from 13th-starting Dave Blaney, Schuchart and 23rd-starting Greg Wilson. It was Marks' third career World of Outlaws Craftsman Sprint Car Series victory and first at the historic Eldora Speedway. Marks dedicated the win to Greg Hodnett, who passed tragically the night before in an unsanctioned race in Pennsylvania. Logan Schuchart won the Sears Craftsman Dash to earn the pole for the 30-Lap Feature, alongside David Gravel. Schuchart darted out to the early lead and Brent Marks, who started third, blasted around the bottom to take second down the backstretch. Schuchart set a torrid pace out front as Marks went to war with Kraig Kinser for the runner-up position. With Marks banging down the cushion and Kinser catfishing around the bottom, the duo battled side-by-side for the better part of five laps. As Schuchart reached heavy lapped traffic, Kinser and Marks’ battle continued and they both closed in on the Shark Racing No.1S. Kinser edged Marks by a nose at the line on Lap 12, which would prove crucial as the caution would fly for Parker Price-Miller, who lost a left rear tire running in the top ten. Schuchart elected the bottom on the double-file restart, moving Kinser to his outside. Kinser, who was glued to the bottom prior to the caution, fell back on the start, as Marks moved back into second. Some contact the following lap between a slew of cars in the top ten, sent Gio Scelzi high into turn one, grazing the wall. Scelzi came down off the wall and got together with Daryn Pittman, resulting in the Kasey Kahne Racing No.9 upside down. Both drivers were uninjured but done for the evening. The ensuing double-file restart saw Schuchart again choose the bottom with Marks to his outside this time. Schuchart remained in command with Marks in tow. 13th-starting Dave Blaney threw his name in the ring, battling Gravel and Kinser for the third position, three-wide at times. Simultaneously, 23rd-starting Greg Wilson was coming, in typical Greg Wilson Eldora fashion, glued to the inside guard rail. Back up front, Marks was closing in on Schuchart and threw a slide job for the lead into turn one on Lap 23. Schuchart fought back underneath Marks to maintain the lead going into turn three, where he went to the bottom. Marks put his family-owned No.19 right up against the wall, grabbing the cushion off of turn four and taking command of the field to lead the lap. Marks powered away from Schuchart, who now had his hands full with the hard-charging Blaney and Wilson. Blaney took second from Schuchart and set his sights on Marks. After Marks got held up ever so slightly in traffic, Blaney attempted a slide job in turn three with three laps remaining, but Marks stayed on the gas and powered around the National Sprint Car Hall of Fame member to maintain control. Blaney’s slide job attempt for the lead cost him momentum as Wilson and Schuchart, who found late race speed right up against the outside wall, caught and surpassed the veteran by the White Flag. But tonight, there was no catching Brent Marks, as the Myerstown, PA native went on to win his third World of Outlaws Craftsman Sprint Car Series Feature of the season and of his career. “We’re all really thinking about Greg [Hodnett] and his family, he’s somebody I’ve respected tremendously throughout my whole career and was always a fan of growing up in Central Pennsylvania. This race is for him and his whole family and everyone back in Pennsylvania mourning his loss,” an emotional Marks said to a large applause from the Eldora Speedway crowd. “This is awesome, I can’t believe I won a race at Eldora. This is my first Outlaw win that my Mom and Dad were able to see. I can’t thank my guys Jesse and Dallas enough, and we just added Jim Shuttlesworth. Last week was our first weekend together, we kept talking and improving throughout the night and working together well. This is special, I can’t believe I’m standing in Victory Lane at Eldora,” Marks added. 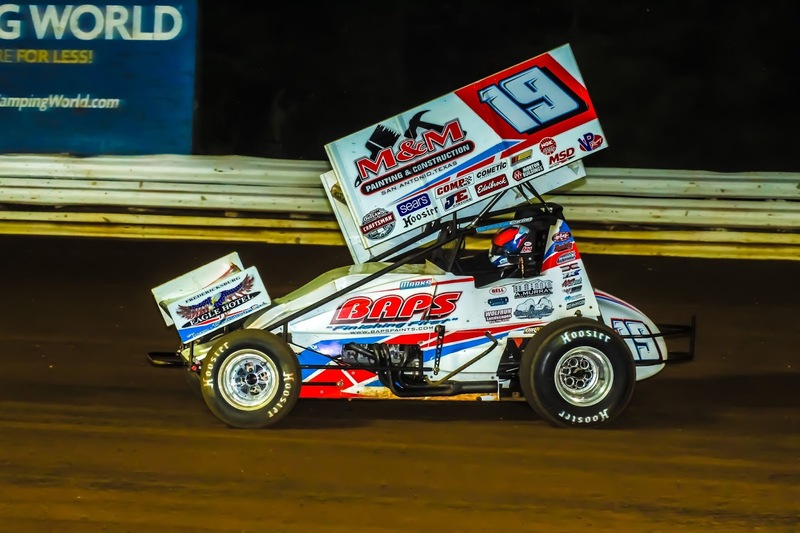 “I can’t believe it’s my sophomore season with the World of Outlaws and I have three wins now, I can’t thank everyone who helps out with this operation enough,” Marks concluded. “This is all for the Heffner Racing No.27 team and everybody back home, we’ve got a couple of PA boys up front and this is all for them,” Schuchart added with emotion. The obvious KSE Hard Charger was 23rd-starting Greg Wilson who finished on the podium for the second time this year at Eldora. “We’re good when it slicks off. This is how the tracks need to be. The race track was awesome tonight, there was passing,” Wilson said before reflecting about the recent tragedy in Sprint Car Racing. “My heart goes out to the Hodnett family. I woke up this morning and looked at my wife and girls and wondered if I should keep doing this. I love it, though. I wouldn’t trade this opportunity to race with my wife and kids at Eldora in front of all you fans for anything,” Wilson, the Ohio native, said to a thunderous roar from the crowd. Dave Blaned faded to fourth in the closing laps, still no small feat coming from 13th, with Gravel completing the top five. Kraig Kinser was strong all evening and settled for sixth with Hunter Schuerenburg, who set Quick Time, and Sheldon Haudenschild finishing seventh and eighth, respectively. Rico Abreu charged from 21st to ninth with 17th-starting Jason Sides completing the top-ten. The World of Outlaws Craftsman Sprint Car Series makes the trek to Western Pennsylvania tomorrow night, September 22 with the running of the Commonwealth Clash in Sarver, PA. As always, if you can’t make it to the track, watch every lap LIVE on DIRTVision.com.